One of the other exhibits belonging to the Scottish Maritime Museum does, however, appear to be having some attention given to her. 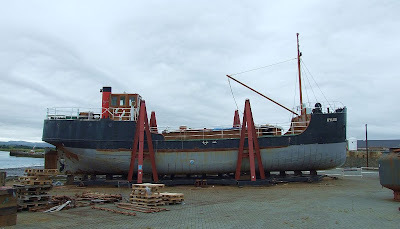 She is the Paisley-built coaster KYLES, a product of the John Fullerton shipyard and dating from 1872. As such, she is considered to be the oldest Clydebuilt vessel still afloat in the UK, although she was taken out of the water after SPARTAN had vacated the slip a few months ago. KYLES was originally steam driven, but was converted to diesel power in 1953. She served a number of owners over the years, in a variety of roles, and was acquired by the Museum in the early 1980s. She was purchased and restored to 1953 condition, and from 1999 was on display at the Museum's Braehead location. KYLES is, like many of the UK's elderly ships, listed on the Register of Historic Vessels. Surprisingly, throughout her long life, she has always carried the same name.